Holy prayer wheels! You mean to tell me that there actually used to be communists in the old Tibet, that there were people who wanted democracy and the end of monastic feudalism, that Kham Tibetans and Chinese fought together against the Dalai Lama’s government, that many lamas were backward and oppressive! That the Communist Party betrayed all its promises, imprisoned or murdered its members and ditched socialist equality for Han racism - that I can believe. But this! I’m just a simple monk so I’m more comfortable with the black-and white picture – that the Communists are black and the lamas are white – while levitating, choosing where to be reborn, being emanations of Manjusri, reading minds, having rainbow bodies and chatting with Dorje Shukden. Read the article below and see what you think. In 1979 an article entitled ‘The Twentieth-Century Bastille’ appeared in a Chinese dissident magazine. It described the fate of two Tibetan prisoners, the founder of the Tibetan Communist Party, Phüntso Wangye, and his close ally Ngawang Kesang, who were languishing in Beijing’s Qingchen Number One Prison, where high-ranking Communists opposed to the policies of Mao Zedong had been incarcerated. It was the first that had been heard of either of them since their arrest in 1960. Phüntso Wangye (affectionately known as Phünwang) was special adviser to the Chinese Peoples Liberation Army in 1950 when they entered Tibet. Phünwang comes from Kham, an area that has always had a mixed Tibetan and Han population, Western Kham has been incorporated into the Autonomous Region of Tibet, and Eastern Kham became part of Sichuan Province in 1955, the Yangtse river forming a natural administrative boundary, but people of both nations continue to live on both sides of the border. It was the disastrously insensitive implementation of secularisation and collectivisation in the areas of Kham in Sichuan province that precipitated armed revolt in 1956, and afterwards some 60,000 Tibetans from Kham fled into the Ü Tsang Autonomous Region, a contributing factor in the Tibetan revolt in 1959, that was also precipitated by CIA involvement. Phünwang grew up in Batang under the rule of Chinese warlord Liu Wenhui. A garrison town under the late Qing dynasty, Batang had a modern government school that had sent a stream of students, Phünwang’s uncle among them, to train as Chinese administrators in Nanjing. This is a very interesting detail because it shows how being an ethnic Tibetan was not an obstacle in the Qing period to becoming part of the state bureaucracy, provided you mastered Mandarin. The dismemberment of China by colonialism and warlordism therefore closed the route to economic and social advancement for Chinese of all nationalities, even those not under direct foreign rule. In 1932 Kesang Tsering, a local Nanjing-educated commander acting for the Chinese nationalist Guomindang (KMT), led an uprising in Batang against Liu Wenhui and proclaimed Tibetan rule. Again it is interesting that Tibetans fought for the Chinese nationalist KMT of Chiang Kai-shek, illustrating how the politics and history have always been intertwined. Phünwang was determined to follow in the footsteps of Kesang to study in Nanjing, as he puts it: “so that I too could become a leader in the fight for freedom for our Tibetan people…I didn’t admire Kesang Tsering and my uncle simply because they had defied the Chinese [but] because they were educated, sophisticated and modern, as well as committed to the belief that Khampas had to rule Kham.” Tsering Shakya in New Left Review explains how it was a teacher, Mr Wang, at the special academy run by Chiang Kai-shek’s Mongolian and Tibetan Affairs Commission, who first introduced the 16 year-old Phünwang to Lenin’s “Nationality and the Right to Self-Determination”. With the Japanese invasion the academy was evacuated west to the temporary capital of Chongqing in Sichuan. Discipline loosened and political debate increased. For Phünwang and his fellow Tibetan students, Lenin’s formulations on national self-determination came as a revelation. The 19 year old Phünwang returned to Kham, initially working as a Chinese language and music teacher while vigorously pursuing his political goals. The strategy of the tiny Tibetan Communist Party under his leadership during the 1940s was twofold: to win over progressive elements among the students and aristocracy in ‘political Tibet’—the independent kingdom of the Dalai Lama—to a programme of modernization and democratic reform, while building support for a guerrilla struggle to overthrow Liu Wenhui’s rule in Kham. The ultimate goal was a united independent Tibet, its feudal social structure fundamentally transformed. Phünwang gives testimony to the arrogance of the traditional feudal elite, the cruelty of some of the monks he encountered during his travels and the poverty of the peasants—worse than in China itself—under the heavy taxes and corvee labor system. 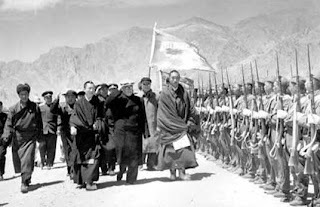 In Lhasa, Phünwang tried to persuade the youngest member of the Kashag, Tibet’s Council of Ministers, to provide rifles for the armed struggle in Kham. But the Kashag was instead pinning its hopes on a fascist victory in the second world war to weaken China. Indeed, the modernising faction within the Tibetan state, let by Tsarong had earlier sought alignment with Imperial Japan in the first years of independence, until in 1925 the anti-reform feudal conservatives managed to have Tsarong ousted. In the spring of 1949 the Tibetan Communists heard that the Chinese communists had established guerrilla bases in Khampa areas of Yunnan, and that the Burmese communists also had a strong force in the area. While making plans to join them, Phünwang and his comrades were expelled from Lhasa by the Tibetan government, now jumpy at the prospect of imminent Communist victory in China. Travelling via India, the Tibetan Communists reached the field headquarters of the Western Yunnan forces in August 1949. Here, however, the Red Army commander, a Bai named Ou Gen, demanded that the Tibetans dissolve their party into the CCP as a condition of joint guerrilla activity. After much argument, Phünwang agreed. Having failed to locate a progressive reforming force within Tibet that could provide a path towards his aim of ‘self-rule as an independent communist Tibet’, he decided to work through the Chinese Communist Party with the aim of establishing ‘an autonomous republic that would function in a similar way to the autonomous socialist republics in the Soviet Union…it would be under Chinese sovereignty, but it would be controlled by Tibetans.’ Phünwang played a key diplomatic role in negotiations over the Seventeen-Point Agreement between Beijing and Lhasa, and in winning acceptance for it from members of the Tibetan aristocracy. Almost from the start, he was critical of the Han chauvinism and ‘top-down’ attitude of many of the Chinese CCP cadres. But he succeeded in opening the country’s first ever secular school in Lhasa - earlier attempts to do so had been shut down by the monasteries - and established a newspaper, drawing in leading Tibetan intellectuals to write for it; reforms that would have been impossible in independent Tibet. Crucially, Deng Xiaoping, leader of the South-west Bureau backed a cautious approach to social reform and winning the support of the Dalai Lama and monastic elite, and Phünwang was influential in shaping policy within Tibet within the first few years, advising that a slower pace that respected local traditional culture would be more productive in the long run. Unfortunately, both Deng and Phünwang were opposed by the ultra-left North-west Bureau under Fan Ming, an ally of Mao Zedong who maneuvered Phünwang out of Tibet and to a government post at the Nationalities Institute in Beijing. Phünwang acted as interpreter between Mao Zedong and the new, young Dalai Lama, and was convinced that Mao was at that time sincere in intending to allow full autonomy within the PRC for Xinjiang, Tibet and Inner Mongolia. But the nationalities policy of the PRC became subordinated to the ultra left turn of the Great Leap Forward. As a delegate to the 1957 National People’s Congress Phünwang was openly critical of Fan Ming’s policies in Tibet and Kham. The following year he was summoned before a disciplinary committee and ordered to ‘cleanse his thinking.’ The “anti-rightist” campaign was getting under way, and Phünwang became a non-person. In 19 60 he was arrested and disappeared into Qingchen gaol. Phünwang was released from prison in 1979, and had suffered torture, isolation, and mental distress. Impressively, after just a year’s recovery, he returned to active politics, drafting proposals for an ‘autonomous republic’ model for the 1980 debate on the PRC Constitution, and arguing powerfully that the Chinese Army should not be used for police work in the minority nationality regions, where its role was all too comparable to that of an army of occupation. When his suggestions drew down a damning attack from Party officials, Phünwang responded with a long rebuttal. Now in his 80’s and officially rehabilitated, he remains a critical voice within the CCP, still attentively following developments in the Land of Snows.As Tsering Shakya explains, Phünwang and other young radical Tibetans allied themselves with the CCP as a means of bringing reform and social change to Tibet; yet once China had established firm control over the region, the Tibetan Communists were deposed and replaced with Han officials. A leading political figure in the 1950s, Phünwang was the only Tibetan to possess any degree of authority during the first decade of Chinese rule. His knowledge of the language and his position as a socially aware figure made him into a vital cultural and political mediator, a role that gave him access to the highest levels of the CCP as well as to the Dalai Lama. Insensitivity, failure to respect cultural autonomy, and knee-jerk secularism exaggerated the problems created by the disasters of the Great Leap Forward and the Cultural Revolution. Phünwang’s active political life was over by 1958. His fate and those of his comrades reveal the problematic nature of Beijing’s approach: after 50 years, the Party has not managed to promote a Tibetan to the top leadership in Lhasa. The dangerous accusation of ‘local nationalism’ pinned on Phünwang is still applied to any Tibetan who opposes the CCP’s policy. In 1979, in a conversation with a delegation sent by the Dalai Lama, Phuntso Wangye declared, “I was and am still a communist who believes in Marxism…I am a communist, true, but I was also in solitary confinement in a communist prison for as long as 18 years and suffered from both mental and physical torture” but then he does not blame party, at all, rather he says, “I was put into prison by people who broke the laws and violated party discipline and the laws of the country.” Prominent Tibetans in exile, accuse him of being a ‘Red Tibetan’ who led the ‘Red Han’ into Tibet and he admits, “To be accurate, I led the People’s Liberation Army. I was the Tibetan who guided the people, who in the words of Chairman Mao, were there to help the Tibetans - the brotherly Tibetans - to stand up, be the masters of their homes, reform themselves, and be engaged in construction to improve the living standards of the people and build a happy new society. But I never meant to lead the Han people into Tibet to establish rule over Tibetans by the Han people.” He argues that those Chinese officials who exhibit Han chauvinism, and who are failing to respect Tibetan rights for autonomy are betraying the ideas of Marxism, and of the Chinese revolution. But without Chinese intervention, there would have been no social reform and emancipation in Tibet. Although many in the Tibetan exile community regard Phünwang as a traitor, Gelek Namgyal, from Tibetan Parliamentary and Policy Research Centre in New Delhi argues that his general reputation among Tibetans is just as “a Tibetan nationalist who wanted to reform the feudal system in Tibet.” Indeed, far from being a traitor, Phünwang is still an articulate voice for Tibetan interests in the PRC. As recently as July 2007, Phünwang declared that the CCP was going down a disastrous route, by closing the door on dialogue, and underestimating the influence of the Dalai Lama in Tibet. Melvyn Goldstein sums up Phünwang’s position: “He sees China as a multiethnic state where large minorities like Tibetans constitutionally have the right to cultural, economic and a modicum of political autonomy, and should be considered equal in all ways to the Han Chinese. The issue for Phunwang is not that Tibetans demand to separate from China, but that they want the Han Chinese to treat them as equals.